Hot air balloons are wonderful subjects because of their bright colors and shapes. Photographing a hot air balloon while its being filled makes for interesting imagery. 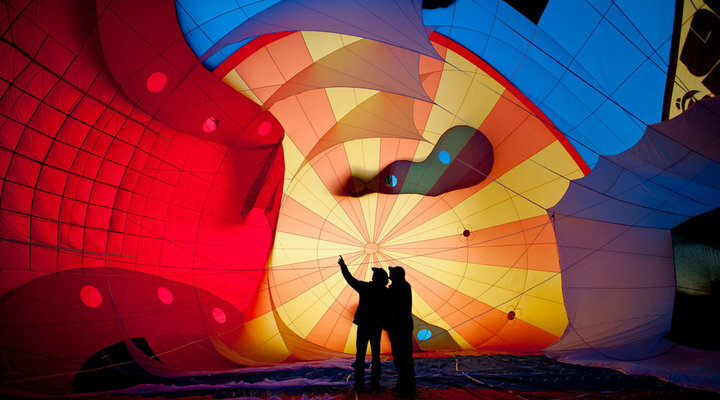 Here the photographer silhouetted two people who are standing inside the balloon as it fills, for a photograph with strong graphic elements. In this photo, the colorful flag fills the frame, while the subjects in the background are in sihlouette (the cowboy, tree and fence). Taken at sunset, the people gathered on the bridge are in silhouette. Its fun to read the body language of each of the people seen in silhouette. This photo is a great example of how one image can tell a story. Three cowboys and a dog are silhouetted in the doorway of this ranch building. We know its a ranch building by the title visible above the door, we see the cowboy hats silhouetted on the heads of the cowboys and we can see the various tools and other items along the back wall of the room. This little lizard was caught in silhouette, crawling along a screen door. With a silhouette, you don't need fine details to make out the subject matter. Silhouettes make for dramatic photographs, relying on shape and oftentimes vibrant, saturated color to tell a story. Photographers use the silhouette to convey drama, mystery or mood in an image, but you can also create silhouettes when shooting video. The subject of a silhouette can be people, animals or objects, identifiable by their outline or black shape against a colorful or well-lit background. The stronger the shape of the subject, the more successful the image will be. While a silhouetted subject can show some detail, the less detail visible will add more drama to the photograph. The key to a successful silhouette is backlighting. To create a silhouette, place a subject against a background and expose for the background, leaving the subject in shadow. Sunsets are great for silhouettes, because of their vibrant colors. You can also create silhouettes indoors by making sure that there is more light on the background, which you’re exposing for, than on the subject. Another way to shoot silhouettes is in the studio. Set up lights to backlight a subject, against a white background, and add colored gels to the lights, for a fun look. When photographing a silhouette of a person, have your subject wear tight clothes instead of loose fitting clothing and shoot them in profile. The profile of a person whether a full-length or close-up shot of their face, will be more recognizable than if they were facing the camera. This is because there will be little to no light on the subject so it is the shape of the person that will tell the viewer they’re looking at a person. This landscape silhouette is a strong graphical image. The negative space of the mountain and the colorful sky complement each other. The moon adds an interesting element to break up the sky. You can photograph subjects in silhouette in low light as well as bright sunshine. As long as the subject is backlit, you'll end up with a silhouette. In this low light image, the trees are silhouetted by the sunlight which is obscured by fog. In this image, the sun, which is behind the horizon is silhouetting the trees and the hill. The color of the sky adds a nice warmth. Whether the background is a colorful sunset, idyllic scene in a park, or stark white wall in a studio, you want to meter and correctly expose for the background, which will place your subject in shadow. Digital cameras make it easier to successfully shoot silhouettes because you can see on the LCD exactly how the image looks, and adjust your exposure accordingly. If your camera has Active D-Lighting, make sure to turn it OFF because Active D-Lighting will try to force the camera to correctly expose for the subject that is in shadow. You can also use Exposure Bracketing to shoot a series of shots with varied exposures, and pick the best one. The ideal spot to focus on is the subject, however since the subject of a silhouette is in little to no light, the camera may have difficulty locking on the focus. In this case, manually focus the camera on your subject. You can also try to focus on the edge of the subject, where there will be more of a contrast difference (between the darkened subject and the brighter background). Use as small an aperture as possible, which will help ensure your subject is sharp. You can also choose to further tweak the photo in software later, adding more contrast to make the silhouette seem more dramatic than it may have been while you were shooting. Whether the background is a colorful sunset, idyllic scene in a park, or stark white wall in a studio, you want to meter and correctly expose for the background, which will place your subject in shadow. You can silhouette other subjects besides people. Here the photographer chose to capture a trio of glasses filled with thirst quenching drinks in silhouette against a blue background. Pick a strong subject, with an interesting shape for a silhouette. Meter and expose for the background, leaving the subject in shadow. Focus manually or focus on the edge of the subject where the contrast between subject and background is greatest. Use a small aperture when possible for greater depth of field. If your camera has Active D-Lighting, make sure it is turned OFF. When photographing a silhouette of a person, position them in profile.